Singapore Ministry of Transport released the final investigation report. From the information gathered, the following findings are made. These findings should not be read as apportioning blame or liability to any particular organization or individual. The fuel leak in the occurrence flight was a result of a cracked tube within the MFOHE (Edit: Main Fuel Oil Heat Exchanger) of the right engine. Fuel leaked into various areas of the engine through the core of the engine and the fan duct. When the thrust reverser was deployed during landing, the conditions at the area aft of the turkey feather seal of the core exhaust nozzle resulted in hot surface ignition of the fuel that had leaked from the MFOHE into the various areas of the right engine. As the fire developed, it propagated towards the forward section of the engine and entered the core of the engine through the fan booster inlet. 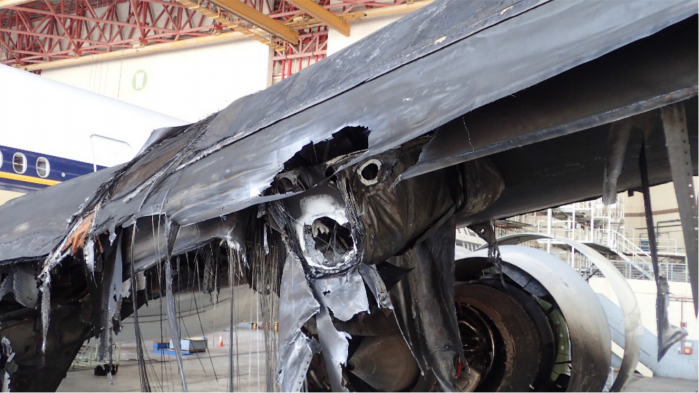 The methods that were used to detect fuel leakage into the engine system by the operator and engine manufacturer were not able to detect the fuel leak that resulted from the cracked tube within the MFOHE when it occurred in that event flight. The engine manufacturer issued SB 79-0034 to address the issue of possible fuel leak in the MFOHE. The deadline for incorporating the SB was determined using the CAAM. The actions called for by the SB was not performed on the occurrence engine as the SB was issued after the engine’s last maintenance. In the course of the investigation, the engine and MFOHE manufacturers have identified that diffusion bonding can potentially cause any tube in the MFOHE to crack. The flight crew did not execute the steps in the FUEL DISAGREE checklist correctly. • Fuel was found present in the oil system of the right engine, which is not a normal condition. Investigators have determined that fuel entered the oil system as a result of a crack in a tube in the engine’s main fuel oil heat exchanger (MFOHE). • GE Aviation had issued a Service Bulletin (SB) in December 2014 identifying certain MFOHEs to be removed from the engines, inspected for cracks in the fuel tubes, and for repair actions and improvement works to be undertaken. GE Aviation had recommended that the actions called for by the SB be carried out no later than the next occasion when the engine is sent for maintenance work in an engine shop. 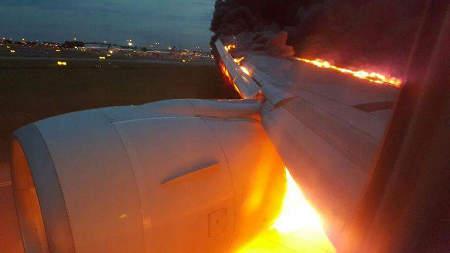 • The engine of flight SQ368 which had caught fire had last undergone an engine shop visit in March 2014, just before the SB was issued. • The Boeing Company, as the aircraft manufacturer, to review the need for operational procedures in the event a flight crew encounters a similar fuel leak situation in flight. – to require GE Aviation to review the need to accelerate the implementation of the recommendations in its main fuel oil heat exchanger Service Bulletin of December 2014. 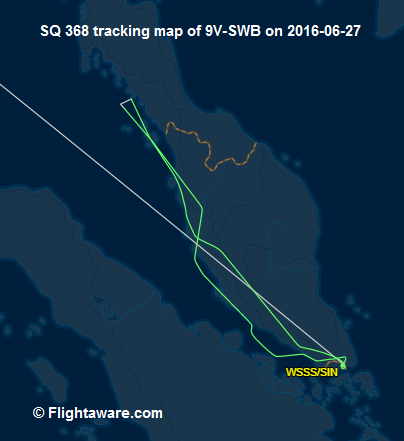 Singapore Airlines flight SQ 368 from Singapore-Changi Airport to Milan (Italy) departed at 02:23 L .
About 90 minutes into flight, while in the cruise at 30.000 ft (FL 300) over the Bay of Bengal about 30 miles (50 km) southwest of Phuket (Thailand) the pilots discontinued the flight and headed back to Singapore on a lower than normal altitude. According to media reports the pilots received an engine oil warning associated with a fuel leak. 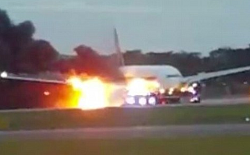 Changi Airport was informed and fire trucks were alerted to be on standby for the landing as a precautionary measure. 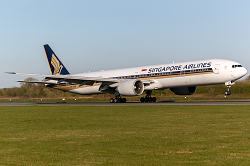 At 06:45L , the Boeing 777-300 normally touched down on runway 20C(enter) at Changi Airport. 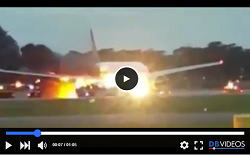 But immediately afterwards, a fire was seen on the right wing which was engulfed in flames seconds later. The pilots stopped on the runway and the airport fire services rushed to the scene but it took them about 5 minutes until the fire was finally put out. During that time all passengers remained on board. 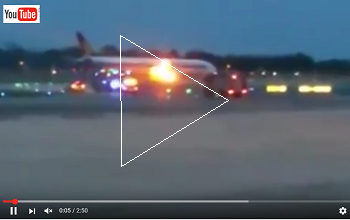 Video of SQ 368 firefighting operations after coming to a standstill. There was no emergency evacuation. The passengers kept calm and collected and there was no panic in the cabin. All on board later left the aircraft on the runway via mobile airstairs. Fortunately, there were no injuries among the passengers or crewmembers. The right wing of 9V-SWB after the fire. The right wing and engine received severe damage. Runway 02C/20C remained closed for about five hours until the Boeing 777 was towed off the runway. 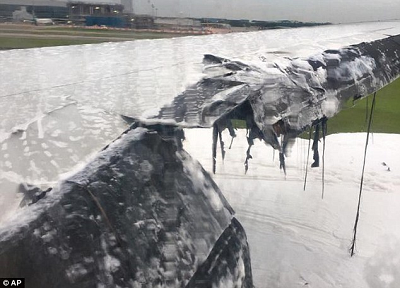 Investigations by the Singapore accident investigating authority (AAIB) commenced.